Surveillance of HIV-1 transmitted drug resistance (TDR) was conducted among pregnant women in South Africa over a 5 year period after the initiation of a large national antiretroviral treatment program. All participants were from Gauteng (GP) and KwaZulu-Natal (KZN) Provinces and were part of the 2005 to 2009 annual ante-natal HIV seroprevalence survey conducted by the National Department of Health. HIV-1 positive serum specimens were tested using the Aware BED EIA HIV-1 Incidence Test. TDR was assessed in primigravid women age <25 years. Genotyping was performed on viral RNA by sequencing the protease and reverse transcriptase genes. A total of 354 sequences were analyzed from 9 surveys. In GP, the levels of TDR were <5% for all drug classes while in KZN levels were <5% in 2007 but appeared to be increasing for NNRTI as these reached 5-15% in 2009. A total of 12 (3.4%) sequences had TDR including K103N and M184I/V. Use of the BED ELISA suggested that samples selected for inclusion into the study were enriched for those with incident infection. 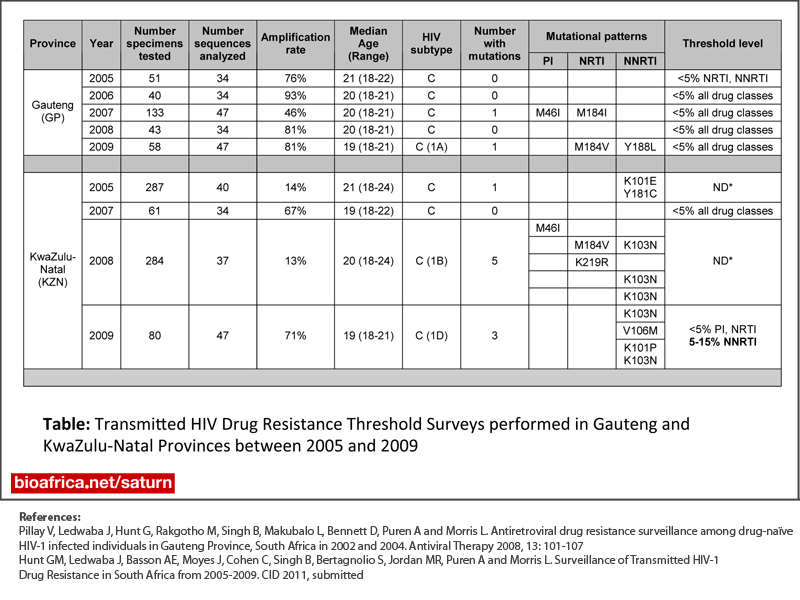 Analysis of the levels of TDR in 2 provinces of South Africa over 5 years suggested that in GP, TDR remains low while in KZN TDR levels may be increasing with the most recent survey showing moderate levels of resistance to the NNRTI drug class. Serological tests for incident infections may be a useful additional parameter to include in surveys of TDR.